I recently joined a book club, and due to some procrastination on my part, I went on a three-day reading binge this weekend to finish Delicious Foods by James Hannaham for my first meeting. I am an empathetic reader, so engrossing myself in the world of a book that begins with a teenage boy escaping an unknown but clearly terrifying situation in a car he is trying to drive without his recently dismembered hands was not an easy read. After spending hours in the brains of these characters and narrators, one of whom is Crack, as in, yes, the street drug crack cocaine, I needed to find a positive and inspirational balance which I sought in the way of a couple of documentaries, Crafted and Sound City. Each was created by an artist for whom I already have familiarity and respect- Morgan Spurlock the documentarian who created Supersize Me and David Grohl the former drummer of Nirvana and the frontman of Foo Fighters. The documentary Crafted features a pair of brothers who own Bloodroot Blades and make their custom knives by hand in their two-person shop; a married couple who owns Bar Tartine and pickle their own vegetables and cure their own meats for the restaurant; and Yugi Nagatani (in the featured quote), the third-generation owner of Nagatini Inn, who makes hand-thrown pots for cooking rice that took years to perfect. Human connection was also a common theme in Sound City. The documentary focuses on a studio with the same name as the film that has a tape-based soundboard called a Neve. In order to use it, musicians have to be in the room together, playing at the same time. This is different from the digitally created form of music-making popular now where one person can create an entire song in a room by themselves and then manipulate the sounds to get what they want. Hannaham’s novel, partially based upon true events, reads as a plea to connect with others to better understand the shared and nuanced expressions of humanity with compassion and to seek the personal truths that remain invisible in the folds of our complicated society. These artists are expressing what science states as well: connection is what we are built to do, an art form inherent in the fabric of humanity, woven through each and every moment of individual lives. Confirmed by research, anthropologists have found evidence that the human brain evolved to the size and capacity that it has because of a need to relate. Mathew Lieberman, researcher and author of the book Social, confirms this in an interview for UC Berkeley’s Greater Good, “To the extent that we can characterize evolution as designing the modern brain, this is what our brains were wired for: reaching out and connecting with others.” He states that “social thinking” is literally our default mode of thought when we are not consciously directing our attention elsewhere. In my personal experience, it is not always easy to “be present” for others’ stories and experiences in ways that allow me to connect. I often times find myself zoning out when I am supposed to be listening to my five-year-old in the backseat telling me about the playground we just passed and what he did the last time we were there. I don’t always seek the “unspoken story” for the angry person who tailgated me on the highway before speeding around to the passing lane or the dismissive sales clerk scanning my groceries at Kroger’s. I do try, though, to be more present every day. I try to redirect my attention to the person speaking when I begin thinking of “what I am going to say next.” I try to remember the last time I cut someone off in a hurry when I find myself thinking someone is rude (or worse) because they have done the same to me on a different day. When I do succeed in connecting and understanding, there is little more valuable to me than the moment when my brain is not speaking and my heart is receiving something essential from another. Furthermore, akin to the many and varied artists mentioned in this post, I, too, have found my vocation and my art form to be a rich thread connecting myself to others. Teaching, writing, researching- through each of these venues, my truest self is found and exposed, and because of this, my connection to humanity is deepened and enriched. To humbly expound the words of Rilke, through both being present with others and finding the ways we can most express our own humanity, the “partition” between self and other lifts. The outer world pours in, the inner world glows, somehow more of itself. Human connection will be a common theme in future posts, so I would love to hear where and in what ways others find their deepest connections to humanity. Please feel free to share comments on this post or email me from the “Contact” page. 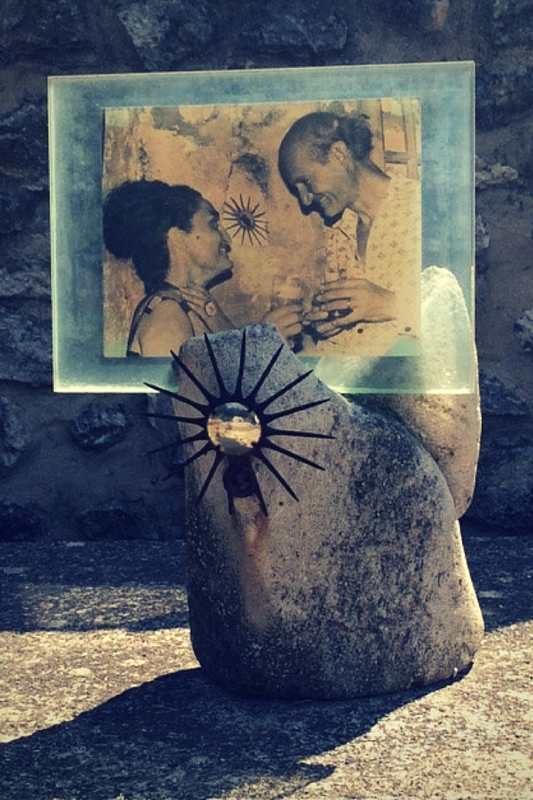 Note: The photo featured here was one I took of an artwork left on a tombstone in Roussillon, France. I thought the couple, the story implicit, and the creation itself were just a beautiful illustration of how our connections and our love persist despite all, even death.